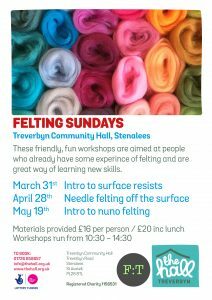 If you already have some experience of this exciting art then Felting Sundays are just for you. Under the inspirational guidance of Amanda Upson, we will be meeting on Sundays throughout spring. Learn new techniques, share skills and have fun with like-minded people. Themes change throughout the season from ‘Surface Resists’ to ‘Needle Felting off the Surface’ to ‘Nuno Felting’. All materials and refreshments are provided so just bring yourselves. These are very popular felting workshops and they get booked up quickly so contact us now to book your place. Or if you are new to felting or need to build up your experience, how about trying our Felting for Beginners group?